Good shoes are important on a man, but so is a good bag. David and Case Bloom, a father and son duo from Nashville have combined their talents to offer some beautifully, well constructed bags that are first and foremost, functional and durable. David Bloom learned traditional bag making skills from European artisans in the early 1970's, and he hasn't stopped since. Over the years, David has designed bags for Perry Ellis, Valentino and at one time, he spearheaded the travel line for Coach. His son, Case is tech savvy and has been essential in allowing his father's line to thrive online. From top right, The Tokyo Duffle Bag, Canvas London Duffel Bag, Cosmo Baker North to South Messenger Bag and the Canvas Swiss Laptop Backpack. 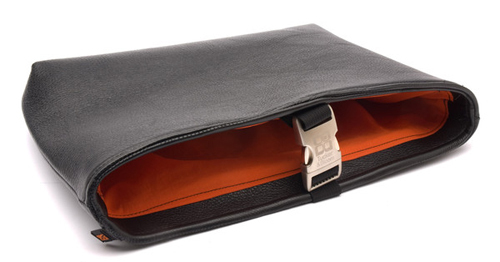 A black leather laptop bag with an orange nylon interior is a handsome choice. It's the kind of bag that will endure for years to come and if you ask me, is an amazing gift.